For a long time I’ve wanted to switch to the Arca-Swiss style of quick-release (QR) system for my tripod. The reason: To use an L-plate. For those who don’t know what an L-plate is, it’s basically a metal plate that threads onto the tripod thread of the SLR camera body, but has two mount points. 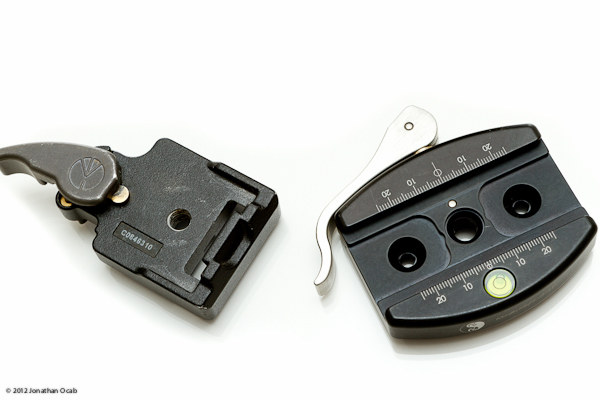 One mount point on the bottom of the camera body (traditional), but another along the side of the camera body allowing it to be placed onto the tripod QR plate in a portrait orientation. 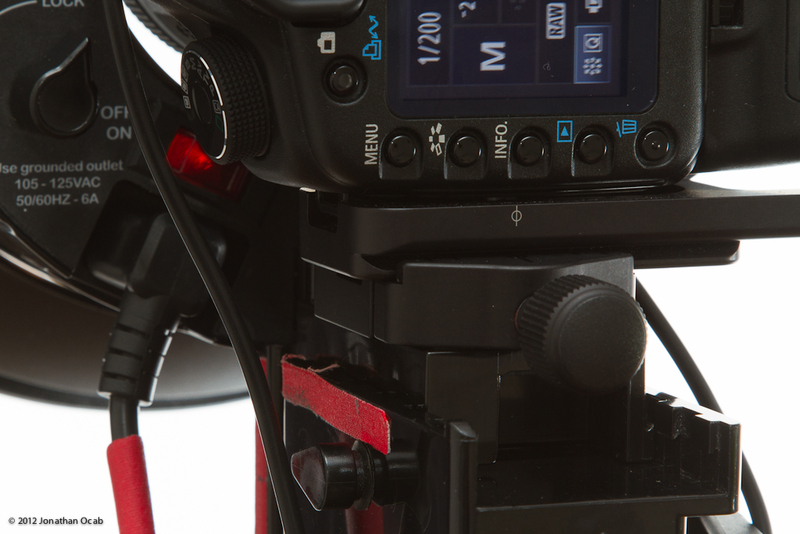 I use the Manfrotto RC2 QR system, which is a ‘traditional’ plate that allows quick (de)attach between the bottom of the camera and the tripod head. While inexpensive and expedient, the RC2 is not as bulletproof in the clamping design as Arca-Swiss style plates. The main reason why I had not converted to an Arca-Swiss style system was the cost of Arca-Swiss style ball heads and camera/lens plates. 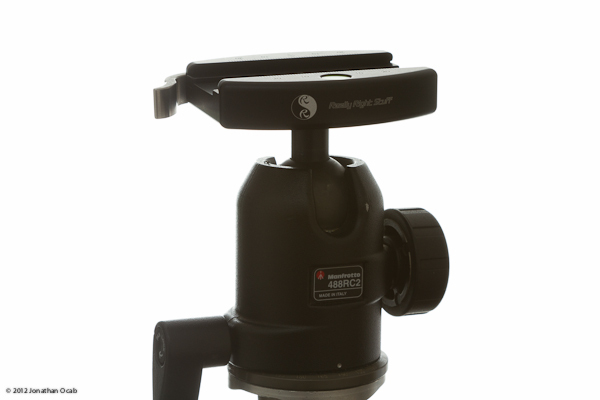 A brand new RRS BH-55 ball head, one of the most renowned Arca-Swiss style ball heads on the market, goes for around $450 give or take ~$50 depending on QR clamp options. Depending on the manufacturer and whether or not you want a regular bottom plate or an L-plate, Arca-Swiss style plates run anywhere from $50 to $175+ ($100 or more for a reputable brand name). 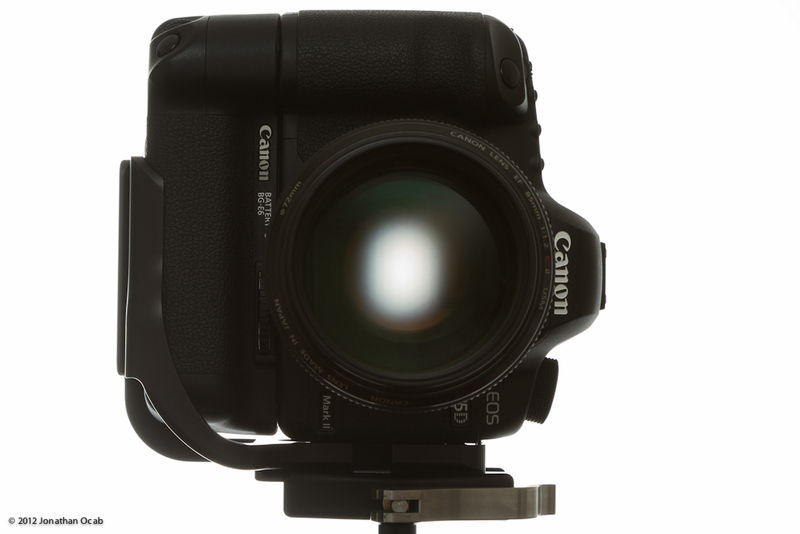 One day I saw a used Canon 5D Mark II L-plate made by RRS on the Canon Forums and the condition and price was too good to pass up. Before I offered to buy it, I looked into my tripod head options and looked over the RRS page and realized I could just get an Arca-Swiss style clamp to replace the clamp on my Manfrotto 488RC2 ballhead. The plate on the 488RC2 is actually screwed onto a threaded stem of the ball on the tripod head with 3/8″-16 threading, and RRS makes clamps that attaches to this thread pitch. So I decided to get a RRS B2 LLR II (80mm Lever Release clamp w/ dual mount) and converted my Manfrotto 488RC2 to take Arca-Swiss style plates. 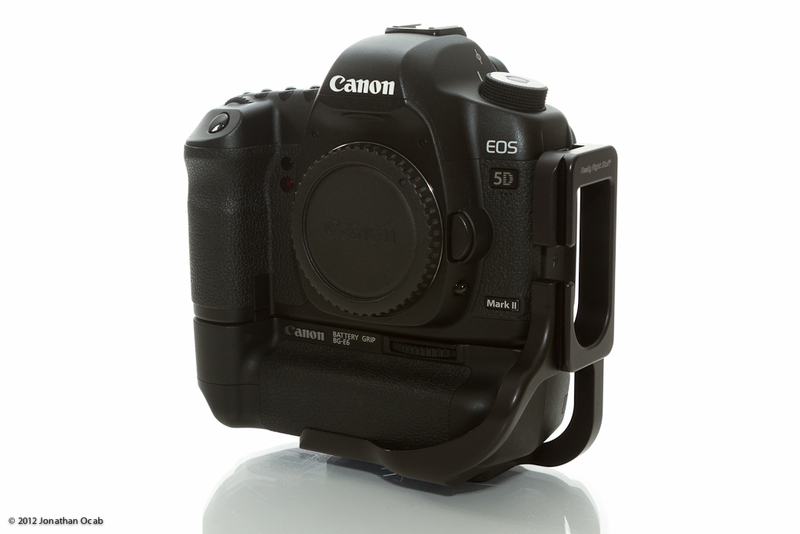 The RRS clamp was just over $140 after tax and shipping and I bought the RRS Canon 5D Mark II L-plate for $140 used. $280 sounds like a lot to many people basically just to be able to have the camera lens on the same axis of the tripod head in either landscape or portait orientation. But that alone makes using a tripod so much easier for things as landscapes (including panoramic stitching) to portrait sessions. 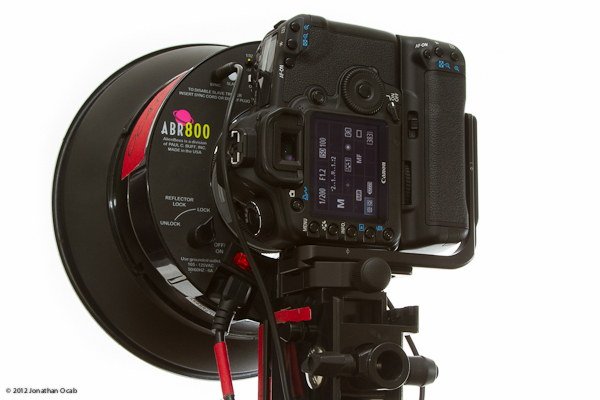 Another situation where the L-plate becomes critical is when using the Alien Bees ABR800 ring flash. If I want to shoot portrait orientation with the ABR800 and the camera is mounted in the ABR800 in the traditional landscape orientation (tripod thread on the bottom of the camera), I would have to handhold the ABR800 and tilt then entire unit. But I picked up a Kirk Enterprises 1.75″ clamp with a 1/4″-20 thread that I put on the ABR800 camera mounting plate, which allows me to use an Arca-Swiss style plate on the ABR800. 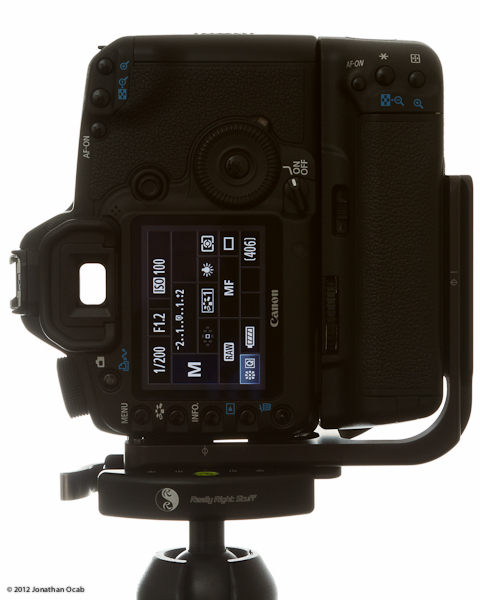 With the L-plate, I can then use the ABR800 in either landscape or portrait mode without having to turn the entire unit. This means I can also use the camera in portrait mode, in the ABR800, and on a tripod. This is great for when I’m using my Canon EF 85mm f/1.2L II which is an awesome portrait lens that I just don’t utilize enough (I tend to use the Canon EF 70-200 f/2.8L IS II all the time). I acquired Arca-Swiss parts back in February. At the time of this writing, I now have in hand the Canon 5D Mark III and am still waiting for the Canon BG-E11 grip. I already pre-ordered the RRS L-plate for the 5D Mark III with BG-E11 so that’s another $180 or so spent on another L-plate. An Arca-Swiss style solution isn’t for everyone, but for anyone that can make use of the versatility it offers should definitely take a look into it. Even if cost is deterring anyone from making the jump to Arca-Swiss style plates, they should consider doing what I did and look into converting their existing tripod head. While I spent $140 for the replacement RRS QR clamp, there are other cheaper options from RRS (I could have gotten something smaller than the 80mm clamp) or other manufacturers like Kirk Enterprises. Spending ~$100 to convert an existing tripod head to use Arca-Swiss style plate is easier on the wallet than spending $400+ on a new Arca-Swiss style tripod head, and gives you the ability to use L-plates for a low startup cost. Note: The two Arca-Swiss style heads I was considering buying to *replace* my Manfrotto 488RC2 (now discontinued; succeeded by the Manfrotto 498RC2) were the RRS BH-55 and the Induro PHQ3 5-way panhead. 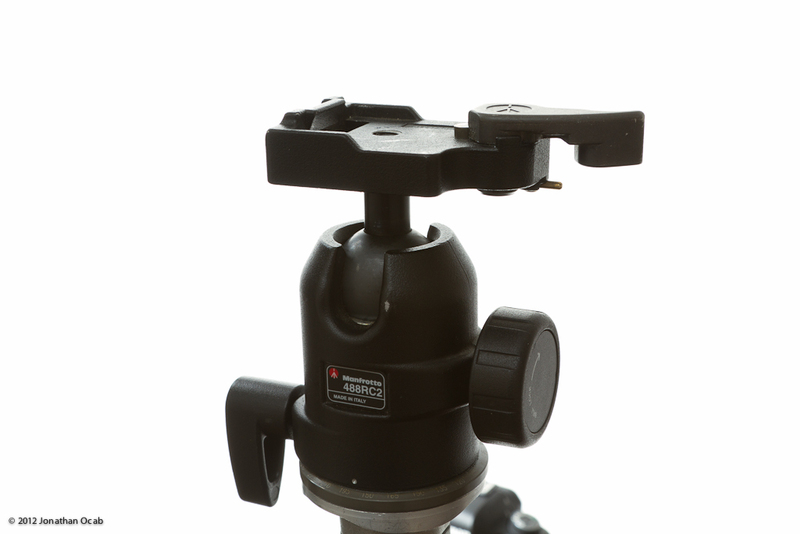 While expensive, these are two high quality and reliable tripod heads. Whenever I do find extra cash to invest in a new head, I will definitely pick one of these two (unless something better is released, either by RRS, Induro, or another manufacturer). How the heck did you get the Manfrotto plate off? I am trying but it seems like it designed not to come off. I have a 486 RC2 which is very similar to the 488. I took the clamp off my 488 ball by tightening the ballhead as much as possible, and then just using a lot of force to unthread the clamp from the ballstem. I just used my hands. That clamp does have some sort threadlocker on it, but that shouldn’t really impact on how much torque you need to place on the clamp to get it off the ballstem. Hi. Thanks a bunch for this. Any reason that this conversion would not work with the 496RC2 head? It should work. You just need to know what the tread pitch is for the ball stem so you know which plate to get. I’m about to purchase this head, so I don’t have it in my hands yet. Specs say 3/8, yet not sure about the pitch since I can’t find it listed anywhere. I feel confident that it hasn’t changed since the 488. I’m trying to do the same thing except I have a Manfrotto 496rc2 ball head and a Markins QL-48 clamp. 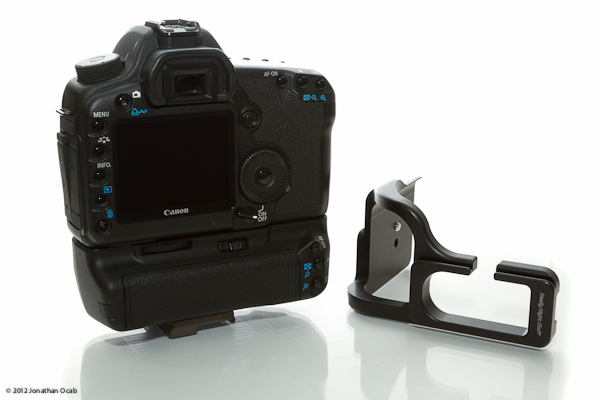 My concern is the existing Manfrotto rc2 clamp and the “post” on the head have indentations so that they mate perfectly and are unable to rotate once screwed together. The Markins (or RRS) clamps have no such indentations. Is the tension when screwed together sufficient to keep the clamp and head from rotating ? If I recall, there was some sort of thread locking material on the threads of the ball stem with the original Manfrotto OEM clamp. But I didn’t use thread locker, Loctite, etc when I replaced the Manfrotto clamp with a RRS clamp. I just tightened it on by hand by locking the head in place, then the ball stem, and then screwing the new clamp onto the stem. Found this website while doing a search on the subject. I think you will find that the RC2 has a 1/4 inch stem for ball head to clamp and not 3/8 inch. However, RRS do have some sizes other than 3/8 inch. I did correspond with RSS on this and they said that they might be able to modify the Manfrotto ball head.